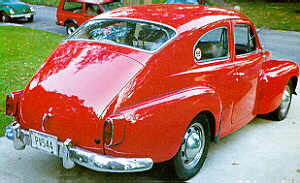 Some time back John E. Switzer of the Washington Volvo Club sent us a letter about his PV544. He had built a big valve B20 motor with 40DCOE Weber carbs and a performance cam and subsequently installed it into his PV. This had the effect of turning his car into a little demon, much to the consternation of the local BMW and Mercedes drivers. However, it did look, to say the least, somewhat tatty. In the end, John decided that it had to look the "business" as well as go, so one June he started to work on the refurbishment of the bodywork. The photos show the PV resplendent in its new coat of paint, lovely, as I think you will agree. For those of you who like unusal number plates, note John's registration (top left), neat or what. The following are some notes and tips from John.. I AM happy to report that my Red 1964 PV-544 is looking beautiful again thanks to the efforts of Jaime Duque of J & J Auto Body (now closed, sadly). He did an excellent job, at a reasonable price and on time. I have two tips to pass on if you have a PV. (1) For the last three or four years, I have been soaking the fender seams with WD-40, along with headlight areas. Result: no major rust inside the original seams, on fender flanges or on body. Headlight buckets were also as clean as new. The only rust restoration work was at the bottoms of the rear fenders (used metal, no plastic). Car had sat outside all of its life. (2) If you don't plan to do any restoration work just now, go to your nearest Volvo dealer and buy some of the bits and pieces you know you'll need. Store the stuff until you do need it. The effect will be that the computer at the Dealer will see activity on these parts and reorder to maintain stock. That means that the next person who comes in to buy these pieces will be able to get them. How much room does it take to store an 86978? Buy two or three! John still has his Red Toad, and it is now booted out with American racing "Torque Thrust D" 6x15 alloy wheels with 185/65x15 Yokahama AVS Intermediates, and a set of IPD sway bars. If you are driving around Washington DC, look out for the 'Toad'.